The cyclists on the South American Epic just completed the Lake District section on this epic tour. 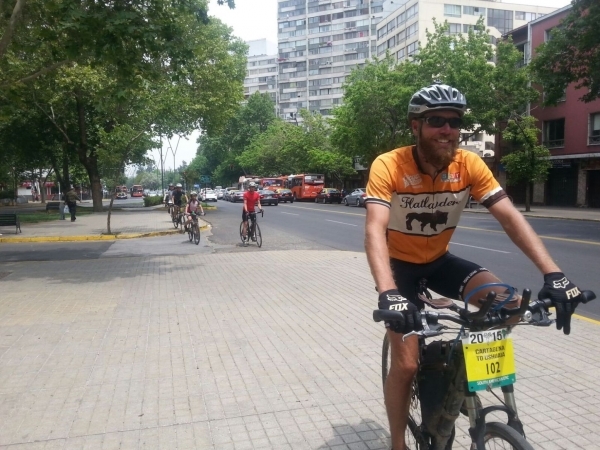 Here Will sums up Santiago – the city where this section started. Before arriving in Santiago, I knew very little about the city. From friends and other travelers I had heard mostly bad reviews – “don’t bother, it’s not worth it” or “it’s just like any other city.” Regardless of the reviews, we did end up stopping along the way. Granted, Santiago does bear many resemblances to large North American cities, but there’s something to be said for one of Latin America’s most modern cities. While it may seem to some ‘just like any other city’ in North America, it is like no other city in South America. In my experience, no other city that I have visited in Latin America has been so manicured, wealthy and well equipped with common-sense infrastructure. While this might not appeal to every intrepid traveler, for those of us on tour who’ve struggled through wind and rain, camping and cold showers for months on end, basic amenities can be a real treat. Apart from the simple joy of a hot shower and a café with WIFI, Santiago is a social and economic enigma on the continent, and for this reason alone I think it deserves some mention. With over 7 million people, Santiago is a sprawling metropolis, situated in the middle of a nation rich in natural and agricultural resources. The city sits just above sea level, but still benefits from mountain views on clear days. The downtown core bubbles over with glitzy skyscrapers, from which neatly dressed Chilean business-people spill out onto polished side-walks. A sharply dressed business elite isn’t unique to other Latin America cities, but what is unique in this city, is just how far the wealth stretches outwards, both geographically and economically. In other Latin cities, step outside commercial core and things start to look pretty dilapidated pretty quick. However, in Santiago, you can drive for up to an hour from the centre, and still experience well-groomed streets, tidy shops and houses, and paved roads filled with rather well-behaved drivers. 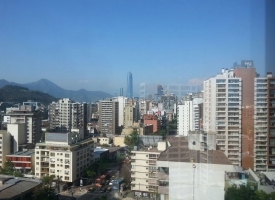 Santiago is a very wealthy city, and much of that wealth is in the hands of a healthy middle-class. A thriving middle class is uncommon in South America. Most countries are polarized, having either super rich or super poor populations – with the latter visibly marginalized to slums. Don’t get me wrong, Chile does have poverty, and it does have inequality, but compared to other Latin countries I’ve been to it is definitely not as prevalent or acute. Why exactly Chile enjoys such a thriving middle class, when the rest of the continent struggles with abject inequality, is not entirely clear to me, nor is there enough room for me to explore it in an already lengthy blog post. The history of Spanish colonization, European migration and investment, rich agricultural land, sea access, and modern industrial sector fuel a robust Chilean economy. From an environmental perspective, their heavy reliance on export-oriented agriculture and mining might not be the most sustainable cornerstones, but they have created wealth that is fairly well-shared in the country. Given that Santiagoians enjoy a bit more jingle in pockets and purses, it seems that they have a little more money to spend on leisure and recreation. This is made evident by the ubiquity of outdoor and sporting shops. Climbing and mountaineering are of course popular given that Chile also boasts some the most spectacular mountains in the hemisphere, but luckily for us, Chileans are bonkers for biking. 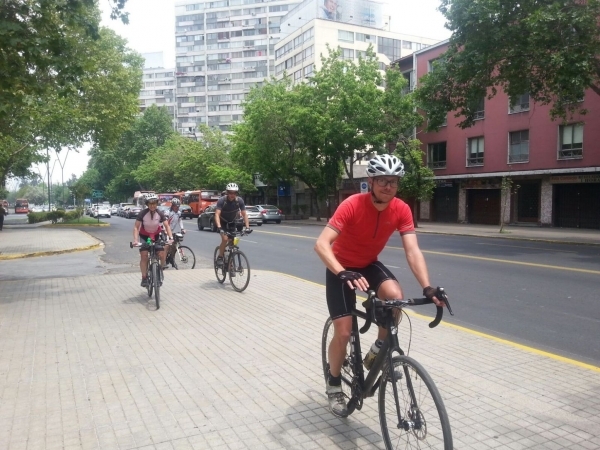 Because of this, the city is littered with bike lanes (ciclo-vias) that transect the grid-pattern of the city with impressive reach – stretching well beyond major routes and well out of down town. On our way to the hotel we snaked beside an attractive bike path that wove through lush green spaces, transporting frustratingly active and attractive Chileans from place to place. Though cars and motorbikes whip down the main boulevards and avenues, Santiago also has a very sophisticated public transit system – in particular their subway system. With five lines running across the city, it’s very easy to get from one end to the other. The platforms are shiny; the service is quick, and all for about $1.50 USD. Modern transportation services like this too are rare in Latin America. Most Latin-American cities’ transportation systems are chaotic, smoggy, vehicular orgies, which (despite their charm) seem to have very little planning involved in their arrangement. Despite the charm of this organized chaos, as Latin American cities continue to grow, Santiago perhaps offers a plausible transportation solution moving forward. Pushes for progress and modernity always come with their costs to custom and culture, and Santiago of course is no exception. Big box stores abound, creating that all too familiar ‘landscape of nowhere’ which can be found pretty much anywhere. But charm and intrigue still live beneath the surface. A perfect example of where modern and traditional have come to a workable compromise is the central market. Situated in a massive old colonial building which stretches several blocks, this commercial centre has everything a shopper could find at a big box location, but all the charm of an old open air market. You can easily find your electronics and brand-name running shoes, but like the traditional markets we’ve passed through in Peru and Bolivia, the aisles spill over with neatly piled fruit and vegetables stalls, and a fresh seafood market showcases of the local favorites. 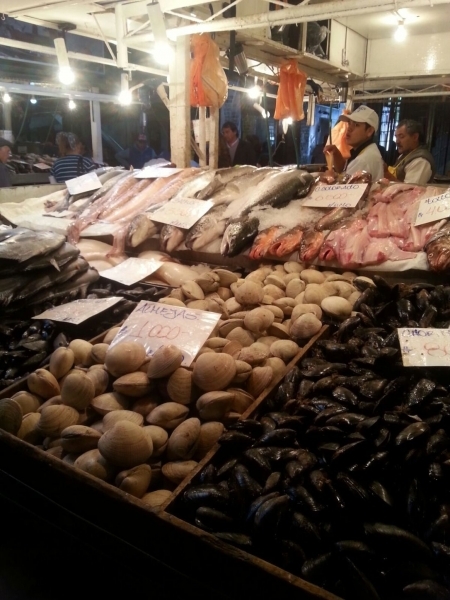 Right beside the veg and seafood stalls, local hole in the wall restaurants prepare cheap, fresh meals, such as ceviche, seafood stew, fried whole fish, and dozens of other delights. I made a point to graze through sampling everything I could find and afford. To wrap up, Santiago does bear a strong resemblance to many North American cities, but this modern city is quite unique in a South American context. The reasonable distribution of wealth in the country has ensured a strong middle class, an interest in active living, and excellent infrastructure to support cycling and public transit. Though compromises are made in modernizing, Santiago retains its Latin American charm. As a group of haggard cyclists traversing a continent together, Santiago was also a great place to stock up and recharge. Moving on from Santiago, the tour enters some of its most challenging and beautiful portions. Patagonia, here we come! 0 comments for "Summing up Santiago"
Leave a comment for "Summing up Santiago" by visiting the original post on our TDA Global Cycling blog.